Development of the 1500AL traces back to the first K2 low frequency driver, the 1400Nd. 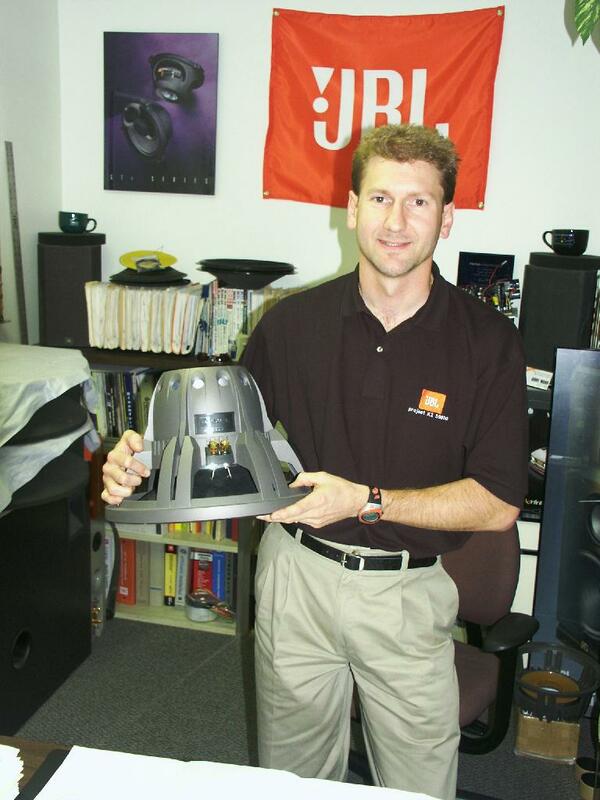 That driver was originally developed in 1989 for the K2-S9500 by Doug Button, currently Vice President of Research and Development at JBL Professional. The intent was to go “all out” in the design of a linear, low distortion, high output driver. From Doug’s perspective, there was only one way to achieve the lowest possible distortion – an underhung design. Underhung designs use a voice coil that is considerably shorter than the magnetic gap in which it is suspended. Most dynamic loudspeakers use a voice coil that extends well above and below the magnetic gap to make the most use of the magnetic energy. However, there is a price in increased distortion. It has to do with the fact that the coil is not acted upon symmetrically by the permanent field once it is displaced from the rest position. Conversely, in an underhung design, the full coil is always immersed in a constant strength magnetic field since it never leaves the gap. Underhung designs are not common in dynamic loudspeakers due to their cost. The fact that the coil height is less than the gap height means that there are always portions of the permanent field that are not in contact with the coil. This is wasted magnetic energy and requires an inordinately strong magnet to ensure reasonable sensitivity. To gain the necessary magnetic flux levels, Doug specified the very first use of neodymium magnets for low frequency transducers. Neodymium magnets have approximately 10 times the magnetic energy by weight as ferrite magnets. Their use resulted in a relatively compact driver that was exceptionally free from distortion, yet had high sensitivity and high output. The 1400Nd driver, and subsequent K2 systems that employed it, were a stunning success. However, Doug was not completely satisfied. Classic underhung designs have a unique frequency response anomaly that is due to the coil topology. It regards eddy currents set up by the moving coil in the gap. These currents act as the secondary in a transformer to effectively short out the coil circuit leading to a loss in voltage drive. The net result is a “swayback” response curve through the midband with about a 2db drop in output. While this can be dealt with in network compensation, the purist in Doug wanted that energy back. Addressing this would be the starting point for the 1500AL design. Design work for the K2-S9800 and its transducers began in 1999. The focal point of this system was to be an Alnico magnet woofer with an underhung coil. Alnico had been the magnetic material of choice for JBL from its very inception until the late 1970’s. In 1978, a civil war in Zaire resulted in the temporary embargo of the commercial supply of cobalt that was a primary ingredient in Alnico. Over a one year period, virtually every loudspeaker manufacturer was forced to switch to more readily available ferrite magnets. Initially, this magnetic material presented problems compared to Alnico. It was less powerful by weight, requiring much more magnetic material than an equivalent Alnico. It was more susceptible to flux modulation caused by voice coil currents and more susceptible to flux loss due to heating. None of these constraints were absolute. Through innovative engineering (eg. SFG, VGC and SVG motors), JBL was able to develop ferrite magnet drivers that exceeded the performance of the previous Alnico versions. Nonetheless, the ferrite developments led to an interesting question. What would happen if the same level of innovation applied to ferrite designs were applied to Alnico motors? As described above, Alnico starts off with a number of intrinsic advantages compared to other magnetic materials. By leveraging these advantages, it should be possible to achieve new levels of accuracy. This became the design goal for the 1500AL. The intent was to end up with a bass driver with the lowest distortion possible while retaining the efficiency and dynamic response that were the hallmarks of JBL. 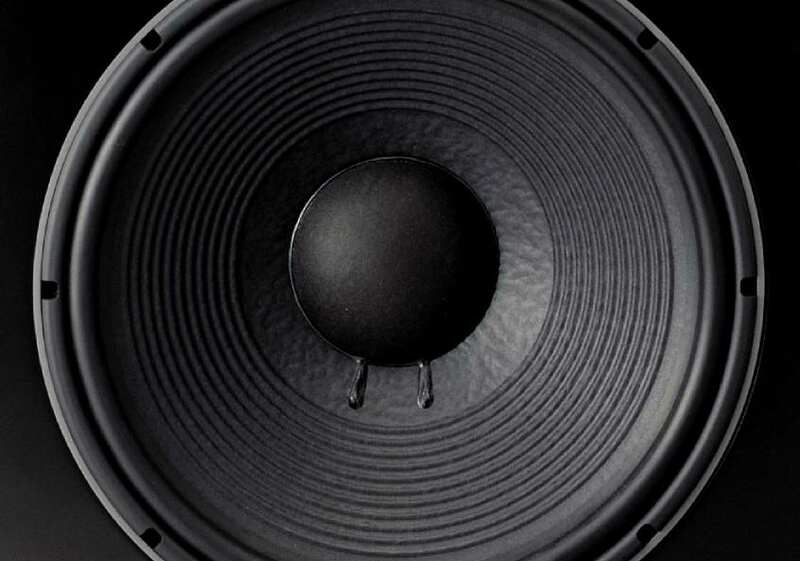 However, there was one major disadvantage in Alnico loudspeakers that would have to be addressed – the susceptibility to permanent demagnetization due to overpowering. This phenomenon is a result of variability in strength of the permanent magnetic field caused by interference from the voice coil’s electromagnetic field. This is referred to as flux modulation and is a leading cause of distortion in any dynamic loudspeaker. The electromagnetic field generated in the coil pushes against the global magnetic field set up by the permanent magnet and return circuit, causing it to “bend”. Under normal operating conditions, Alnico magnets actually resist this bending better than most other magnet materials. However, should this shift become large enough, it will exceed the coercivity of Alnico and cause it to partially demagnetize. 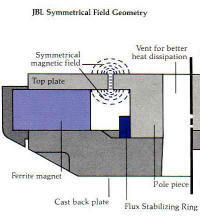 JBL had done extensive work in stabilizing flux modulation during the conversion to ferrite magnet motors. Ferrite is much more susceptible to flux modulation than Alnico. The coercivity is much higher so that extreme modulation will not result in demagnetization. However, under normal operating conditions, this flux modulation will manifest itself as second order harmonic distortion. 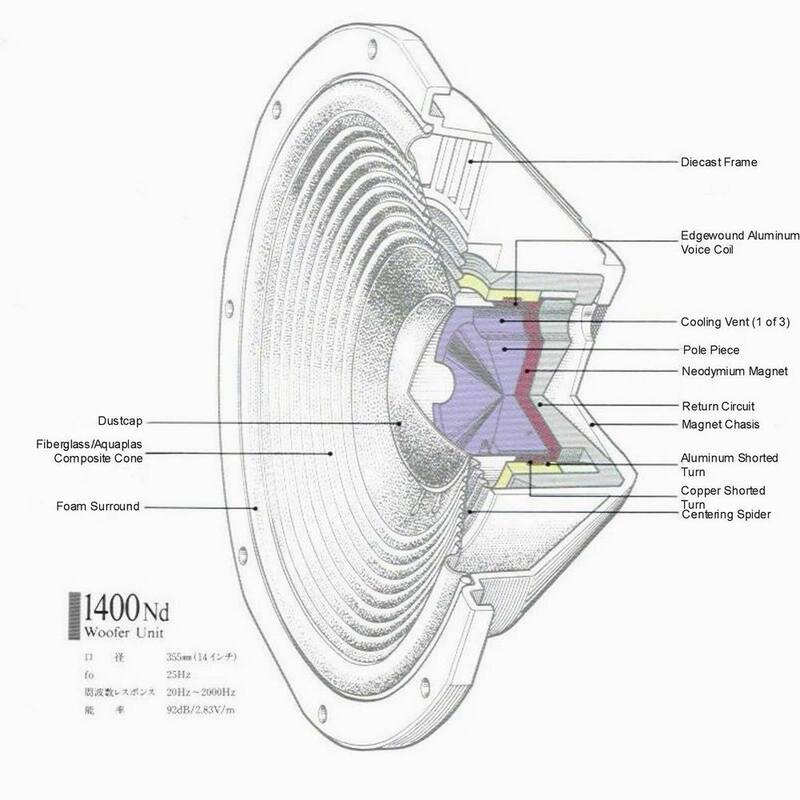 By installing a copper shorting ring around the base of the pole piece, JBL engineers were able to reduce flux modulation, and therefore distortion levels in ferrite motors, to very low levels. Doug Button realized that this same technology could be extended to control flux modulation to such a degree that the coercivity in an Alnico magnet would never be exceeded. He specified a huge copper shorting ring that would buck any changes in the global field that was induced by the voice coil signal. The result was that the major drawback of using Alnico for a loudspeaker magnet had been completely eliminated. Nonetheless, Doug was not done in setting the design parameters for the 1500AL. There remained the previously identified issue of midband loss in output and a more subtle form of flux modulation that was not addressed with the large shorting ring. Doug would devise an ingenious solution that would resolve both of these issues – a lamination of copper and steel rings applied to the outside diameter of the voice coil gap. Before detailing this solution, it is worthwhile understanding the phenomenon of “local” flux modulation. The variability in the overall strength of the permanent magnetic field is referred to as “global” flux modulation and this was controlled through a massive shorting ring. However local variance in the flux field was determined to exist in the voice coil gap, independent of variance in the global field. It was particularly an issue for an underhung design like the 1500AL which had an inordinately deep gap. The AC field generated by the voice coil would cause variance in the gap strength from top to bottom that dynamically resulted in a teeter tottering effect. Doug realized that another copper shorting ring placed in the gap would address this phenomenon. However, it came to him as an inspiration, that by interspersing steel coils in between a series of copper coils, he could break up the eddy currents that were causing the midband loss. Thus, came the specification for a series of laminated coils of alternating copper and steel construction that would be applied to the outside diameter of the coil gap. With this final attribute, the conceptual design for the 1500AL was set. However, there was now the formidable task of developing the concept into a production driver. Responsibility for this would fall upon Jerry Moro, Senior Transducer Engineer for JBL Consumer Products. Jerry recognized that for the dynamic range requirement of modern digital sources, the driver would have to accommodate large excursions. A large coil would be required, but to maintain the underhung topology, there would need to be a gap depth of unprecedented proportions. Ultimately, a 0.8” long coil would be suspended in a 1.5” deep gap. This would accommodate 1” of peak to peak excursion. The magnetic energy requirements to provide a reasonable flux density in such a deep gap was enormous. It resulted in an Alnico magnet of massive proportions. An Alnico slug weighing over 5lbs became the core of the motor structure. The overall structure would weigh over 30lbs. The large excursion requirements presented unique suspension demands. Normally, the surround and spider are designed to act together to provide restoring force and damping for the cone movement. However, with these large excursions, the different construction of the surround and spider would result in non symmetric response to deflections and therefore distortion. Jerry addressed this by designing a mirror imaged pair of spiders that acted symmetrically and thus allowed the surround to be optimized for linearity. Mirror imaging the spiders resulted in any distortion components being cancelled out. A major focus of Jerry’s design for the 1500AL was to minimize power compression. Power compression regards a reduction in output as power levels increase. It is the biggest factor in restricting dynamic response. Therefore, mitigating it to the maximum degree became a design objective. Heat is by far the major culprit behind dynamic compression. It causes energy losses in the permanent magnetic field and impedance changes in the coil that conspire to reduce output as heat builds up. Jerry designed a series of measures to dissipate heat. First, the pole piece and magnet have three channels embedded along their outer circumference. Air trapped behind the dustcap is forced past the coil and out these channels to convectively cool the coil. Next, an aluminum motor cap completely surrounds the magnetic return structure. A series of ribs draws heat away from the iron pot to the cap which acts as a large heat sink. Finally, there is an air gap between the cap and the pot structure that is vented in the rear. The motion of the spiders pumps air into this gap to provide further convective cooling. 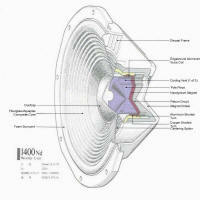 The net result is a woofer that arguably has lower levels of power compression than any other loudspeaker of its size. It can sustain maximum output levels of 118db with minimal distortion. Testing at a 110db output level revealed midband distortion to be down 50db, or around 0.3%. In summary, the 1500AL sets an unprecedented standard for accuracy, dynamic response and freedom from distortion.